Okay, so that might be the least fair name for this particular post, but it was the best I could do. Apparently, my slang knowing days are over. Because M's teeth have been bothering him, I made some chew-free foods for dinner early in the week - a few soups and a batch of ham and scalloped potatoes (which is possibly his all time favorite food) - which meant that for a few days this week, I got to make a dinner entirely for myself. I picked two dishes - both from Simply Recipes and the both turned out awesome. The first was the Baked Shrimp in Tomato Feta Sauce. As we've established, my dedication to recipe following is...not high, so I tend to take the list of ingredients and the general cooking method and just wing it, which is what I did here. Since I was cooking for one, I halved the recipe - a little garlic and roughly chopped onion in the pan, followed by a can of diced tomatoes (damn you off season!) 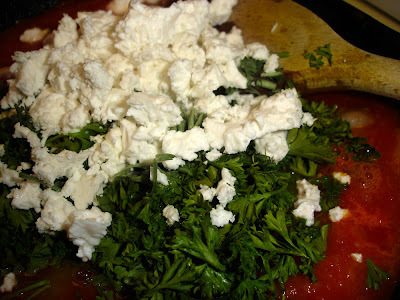 and cooked it for somewhat less time than the recipe called for then buzzed it with the immersion blender because the texture of canned diced tomatoes is weird -then I threw in the shrimp, parsley, feta and dill, gave it a stir and tossed it in the oven as called for. It was awesome. Really, I mean awesome. I didn't take the shells off of the shrimp at all - in fact, I threw them in completely frozen and I liked the really seafoody flavor of the broth because of it. Somewhat less awesome was the burning sensation as I tried to peel the hot shrimp. Of course, you can ask me if I think it was worth it, but you should know I did the exact same thing the next night, so there you go. I ate it with some great bread and gobbled it up - of course all day Thursday all I could think about was how oh-my-god-transcendentally-awesome-my-super-fast-easy-to-make-no-fuss dinner had been the previous evening, so when M's teeth still hurt and I discovered that our kitchen was shamefully devoid of any white wine, I opted to postpone the making of recipe number two and go for the repeat. Thus, the tricycle...except it's a bicycle since I only ate it once, but that seemed less entertaining. Thursday night, I followed the same basic procedure but this time tried to cook it all on the stovetop. I possibly made this choice because I may or may not have forgotten to preheat the oven... In any case, I way reccomend sticking with the "baked" part of this recipe. It's totally low maintence.